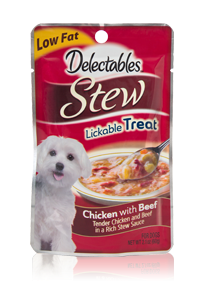 "Delectables Stew Lickable Treats for dogs represents a true innovation in the canine treat category," says Susan Burris, Brand Manager, Dog Treats, Hartz Mountain Corp. "Perfect for small dogs, Delectables Stew is a delicious and lickable wet dog treat that provides a new occasion for treating and healthy snacking and is ideal for dog parents who love to pamper their pets." Giveaway is open to HUMAN US residents only who are 18+ and US residents. It ends on 5/6/17 at 11:59 pm EDT. See Giveaway Rules for more complete rules.